Ok quick ... how many times is Our Blessed Mother quoted in the New Testament? The answer appears to be four. What a beautiful command that is. If we follow it, hopefully our souls, too, can "magnify the Lord"
God Bless you on this feast day of the Assumption. That command certainly was for all of us. 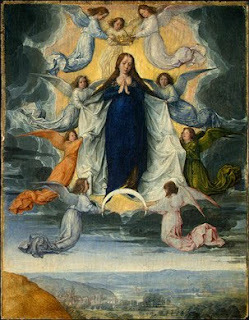 May she obtain the graces for us to follow it. Nice post, Michael. Thanks and God bless! Those words from Mary are the best ones to quote to the protestants who think we worship Mary and don't understand why we pray "to" her. You're right ... it's four times that she speaks and is quoted. She is reported as being at the Crucifixion, but no mention of her saying anything. I think it is so lovely that she was mainly a silent witness to the love of God. I hope to follow her example, speak few words, but point to God through the silence of my life. She's a tough act to follow! Nice work, looking that up for us. A few years ago, I created several Catholic quizzes. One of them is a Marian quiz. They are posted on my side bar if you want to tackle them. Just scroll down until you see them on the right hand side. Great post as usual Michael! Mary is such a great example to us all. God bless you too. I hope you are having a wonderful week.